Austin, Texas is a place that holds a special place in my heart. A few years ago when I felt stuck in my previous job unable to move forward career-wise, I felt that the only solution was to leave my hometown of Chicago behind, move to an all new city and start over. Austin, Texas was that city for me. I visited, I fell in love, I had my future apartment picked out and I was ready to go. However, I ended up with an awesome new job in Chicago and happily decided to stay. Austin is an eclectic mash-up of a city. It's largely made up of people from other cities and states who have moved to work in the advertising, art and technology sectors. It is also home to oodles of millennials. This means the art scene is on point, the food scene is on point, and with the weather of Texas, there are a lot of outdoor activities you can explore during your visit. Usually when I travel I look for nature excursions and hiking trails to trek. However, there's something about Austin that makes me want to slow down, eat a lot of food (mostly BBQ) and get my exercise in by walking and biking around town. Terry Black’s BBQ: Terry Black’s is a massive establishment with endless food options. You get in line and grab as many sides, desserts and meat as you want and pay by the size of each container you take. If you want a quart of potato salad, you grab that quart of potato salad! You can also by your BBQ brisket or pulled pork by the pound so you have leftovers to take with you. Mean Eyed Cat: As a Johnny Cash-themed bar that feels plucked out of small-town Texas, it’s a little off the beaten path in Austin but 100% worth the trip. They sell Stubb's BBQ (another popular meat spot in Austin) and have the nicest bartenders. Plus you can get a shot of their Mean Juice, which is alcohol steeped in hot peppers. The concoction changes often but it’s a perfect way to start your trip! Torchy's Tacos: My favorite tacos in Texas. This place is an Austin institution. There are multiple locations and you can't go wrong. I can literally eat 5 tacos in one sitting at Torchy’s. Easy Tiger: The coolest bar in Austin with a massive outdoor patio with ping pong tables and picnic bench style seating overlooking a creek. The menu is all about sausages, cheese and a lot of beer. Casino El Camino: The best place for a burger that will fill you up for the whole day. It has a heavy metal vibe and is open late. Cenote: A cute breakfast/brunch spot in East Austin with outdoor seating in a garden atmosphere and delicious brunch. A lot of food can also be purchased via food trucks which are a staple of Austin culture. While some cities make it hard for food trucks to thrive with permits and little parking, Austin is built for them. In fact, many buildings downtown having designated food truck parking. Get ready to eat A LOT. After all that food, you may actually want to burn off some calories for at least part of your stay. Thankfully, Austin has so many amazing outdoor spots right at your fingertips. Zilker Park is a massive 350 acre outdoor space on the south edge of Austin along the Colorado river. It is home to greenery, a botanical garden, the Austin City Limits Music Festival and even has a miniature train you can hop on for a tour of the entire park. Zilker Park is located along Lady Bird Lake, which is surrounded by hiking and biking trails and allows kayaking on it's waters. The most popular spot in Zilker Park is the Barton Springs Pool. This outdoor pool is naturally-fed by water from nearby springs and is perfect for year-round swimming. This may look like a typical outdoor swimming pool but if you look beneath the surface, you'll be swimming among plant life and animals like the Barton Springs Salamander. In the summer, Barton Springs can be PACKED with people and as a tourist, you'll have to pay to enter. However, I've found that hiking along the outside edge will take you to the creek filled by the run-off water of the gated pool. This crystal clear water is perfect for swimming and wading. This free alternative to the pool may be a bit more rustic but is still a great place to relax on a hot Texas day. Plus you can bring your dogs here so you'll be surrounded by pups. South Congress: The cutest neighborhood with wonderful local little shops for clothes, jewelry and home decor. Parts & Labour is my absolute favorite for art prints for my apartment. The food options are vast and the vibe is my favorite in all of Austin: very relaxed. Plus you can pick up some signature Texas cowboy boots. Rainey Street: When you aren't feeling the college drunk vibes of Sixth Street (which often happens to me), Rainey Street is the place for you. This stretch of street is bumping at night as many cute little houses have been gutted and turned into bars and restaurants. Each has it’s own particular vibe and you’ll find that many Austin locals have their personal favorites. Rainey Street has such a cozy atmosphere and has quickly become the place to drink in Austin. Probably one of the most famous spots in Austin (and rightfully so) is the Hope Outdoor Gallery, more lovingly known as Graffiti Park. This was at one time a booming construction project that was abandoned. Now it is open to all locals and visitors to make their mark with spray paint. The best thing about Graffiti Park is that no matter when you go, it will never look the same. People are constantly showing up to paint over a previous mural or tag and there's no way to know what kind of artwork you'll stumble upon. You can really explore everyone’s work up close by climbing and hiking up the multi-levels of the half constructed building, all the way to the top. Or borrow a can of spray paint from someone and add to it. Lake Travis, Texas is the so-called "sunset Capital of the World". That may seem like a pretty lofty claim but some of the most amazing sunsets I've seen have been at Lake Travis. 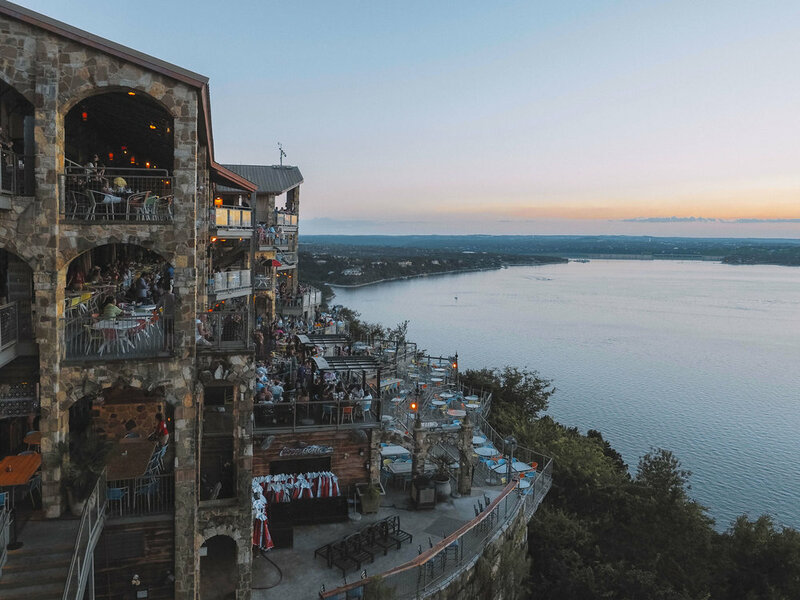 Roughly 30 mins outside of Austin, Lake Travis, a 64 mile man-made lake, is home to wealthy celebrities (it's rumored Matthew McConaughey has a house nearby) and the entertainment district, the Oasis. The Oasis is a massive multi-level establishment made up of multiple restaurants, all with seating along the edge of the cliff overlooking the lake. The food at these restaurants isn't the best (I'm the first to admit it) but I highly recommend grabbing some appetizers and a drink and waiting for the sun to go down over the water in a warm Texas evening. Soon the long drive will be worth it as you watch the colors of the sunset glow from the sky and reflect on the calm lake below. It's a gorgeous show of nature and a great way to spend an evening while visiting Austin.